Need a cool, refreshing drink for a hot summer day, and something like maple water sound a little too silly and hipstery for ya? Well, how about some ginger beer? 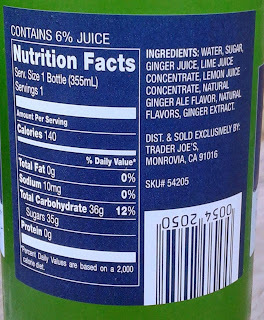 Note: Trader Joe's Brewed Ginger Beer is neither ginger ale nor is it alcoholic. Ginger ale, although occasionally delicious, is your basic ginger-flavored soda, of course. Ginger beer, on the other hand, is a beverage produced with via brewing and fermentation and the whole nine yards. Here's a guide on how to make your own to give you an idea of the process involved. As for the outcome: delicious. Both Sandy and I are pretty big fans. There's very little carbonation, if any, which makes for a cool, crisp flow. Although not as harshly ginger-tinged as some other TJ's brews, there's still a good, solid ginger bite underflow adding lots of bitterness. Yet, there's plenty of tart sweetness to counteract it all, thanks mainly to the limes and sugar. The taste isn't perfectly balanced or smoothed over, though. The first bottle we drank, it almost tasted like we were drinking two different drinks at the same time. When we looked a little closer at the bottom of the bottle, we saw some cloudy floaty stuff, which I'm guessing was some sort of combination of the lemon/lime juice and ginger that kinda settled after fermentation. Although the bottle says nothing about doing so, for the second time around both Sandy and I gave the bottle a slight shake and swirl to try and mix it all back up, and we both agreed that it tasted a little more even after that. Still, this is one pretty delicious drink for those warm, sticky nights up ahead. Plenty of ginger bite with some citrus-y zing is never a bad combo. If you insist on some boozy additions, I have heard (but not yet personally verified) that this ginger beer is a great choice for either a Dark & Stormy or a Moscow Mule. That's definitely on my agenda, and Sandy is even more eager to try that than me. And for this ginger juice, if your mind is on your money (or your money on your mind), you can buy these either separately for a buck each or grab a four pack for $3.99 - math geniuses, them. Definitely worth the try. Matching fours from the wifey and me. I checked out after "nor is it alcoholic". just kidding! LOL This sounds good. I think I'll grab some this weekend. This definitely piques my interest. I love ginger ale, and though different, there's something just a little bit more amazing about ginger beer. Thanks for the heads up, I will be getting this next time I go to TJ! Random follow-up, as I love this stuff but still a tad bit sweet to drink as much as I really want to! 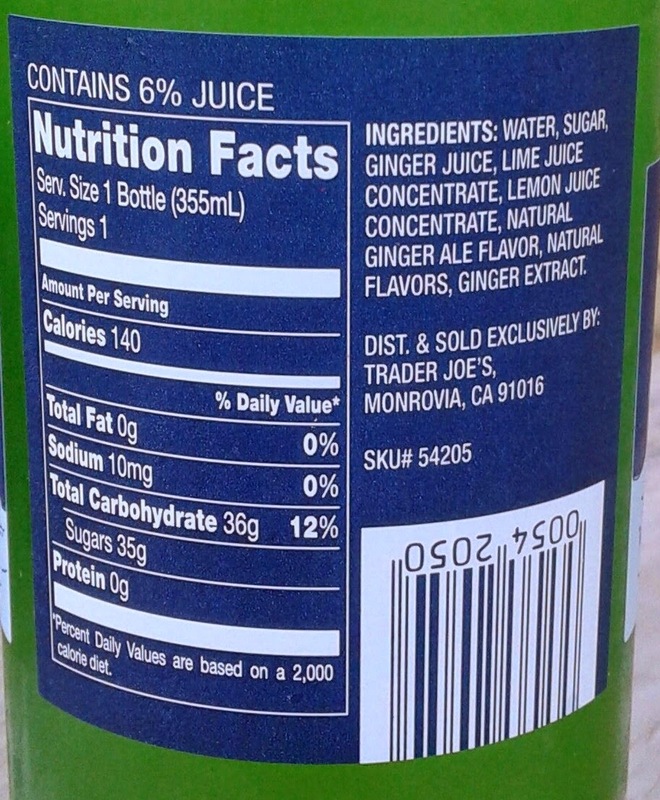 Came up with a great (and more natural) TJ-based recipe to make killer ginger ale/soda. 2 cups water (any brand! ), 1 cup sugar (I use TJ Turbinado Raw Cane Sugar), 1 package TJ fresh ginger root, half a TJ lemon. Add water and sugar to a medium sauce pan, warm over low heat for several minutes while you peel the ginger and cut it into half-inch-or-so chunks. Add the ginger chunks to the warmed sugar/water and squeeze juice from half a lemon in. (Use full lemon if you like it more lemony!) Puree the ginger mixture with a hand blender (optionally, grate the ginger instead of chunks). Bring to the start of a boil, then simmer covered over lowest heat for about an hour, stirring occasionally. Remove from heat and let cool. Optionally filter it in a colander. Add this syrup to carbonated water (Sodastream?) to taste and it is amazingly good!! Not as sweet as the TJ Ginger Beer but a great ginger bite. For the brave, add a dusting of TJ's ghost chile to the syrup efore simmering. 35 grams sugar. Its so sweet you can't taste the alcohol in a Moscow Mule. A good ginger ale would be better.